This year in Magical Sabbatical, we are exploring “A World of Magic.” Each month, we learn about the magical practices of a different civilization. Our exploration spans from ancient to contemporary times. Together, we tap into the power of these magical societies, infusing our own modern practices with their ancient magic. Included in our discovery are each culture’s associated myths and lore that have captivated imaginations for ages. This April, we are exploring the mysterious culture of Minoa, a civilization that carries profound spiritual wisdom. 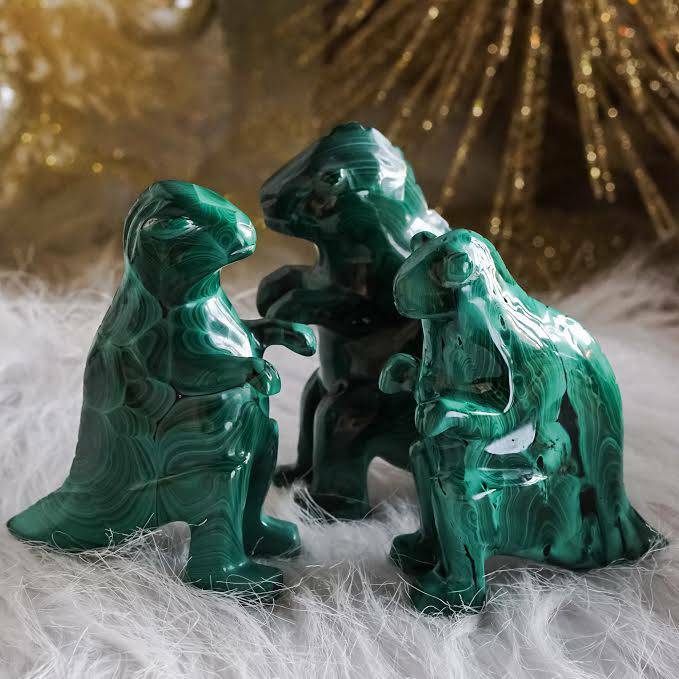 In this set, you will receive an assortment of magical tools to connect with your own powers of transformation. Minoans were a peaceful and highly spiritual civilization; they regarded snakes as the keepers of wisdom because their venom stimulated visions and spiritual expansion. 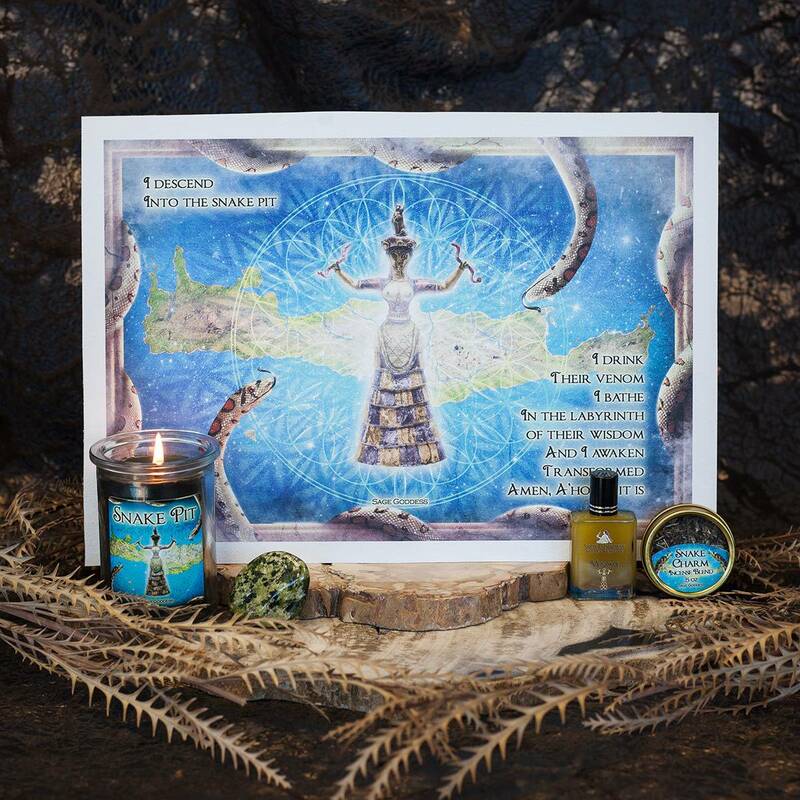 The Snake Goddess of Minoa embodies the ability to change, including spiritual and physical metamorphosis. Use this set to reclaim the power of snake medicine – to heighten your vision, access profound wisdom, and transform. Now, I will not reveal too much here, because we are excited with anticipation to explore the stories and uses of these special products in our classroom this April. This is a special discussion that you won’t want to miss! One (1) 15 ml bottle of Venom Perfume with notes of resinoid benzoin, coriander, and Ho Wood – the oils of spiritual expansion. 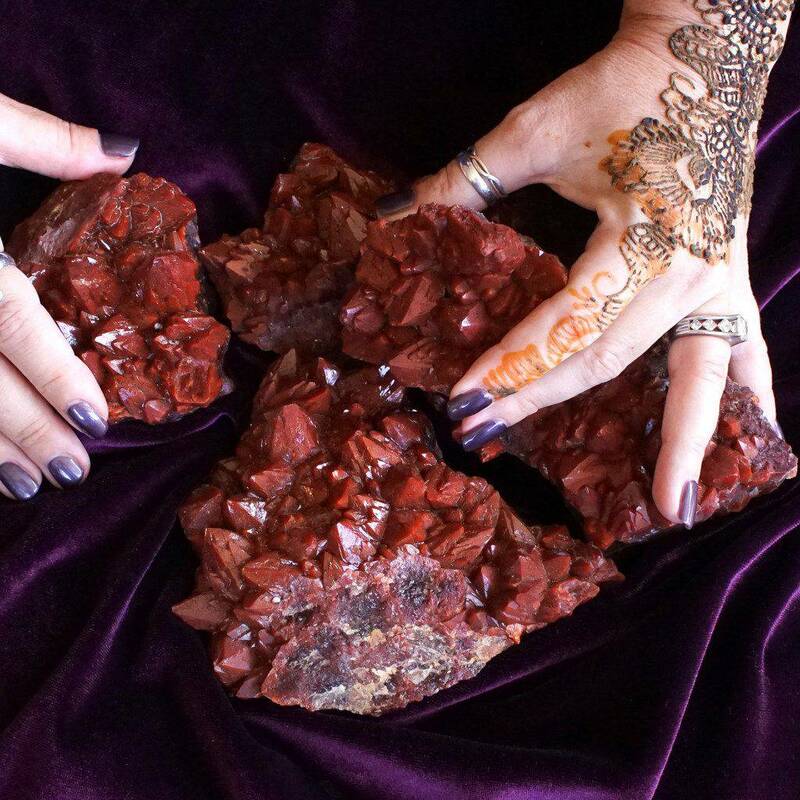 Each bottle of my Venom Perfume is infused with a leopardskin jasper chip stone to further amplify its properties. One (1) Snake Pit Candle (6 oz) hand poured with black soy wax and dressed with a gold-green mica powder. Each candle also holds a leopardskin jasper chip stone and is anointed with my Venom Perfume. As you light this candle, my intention is that you dive into the depths of the mystical snake pit, where the Snake Goddess reveals her visions. One (1) Snake Charm Incense Blend (1 oz), with blue lotus leaf, mugwort, wormwood, mullein leaf, fumitory herb, violet leaf, black storax, and sprinkled with Venom oil. 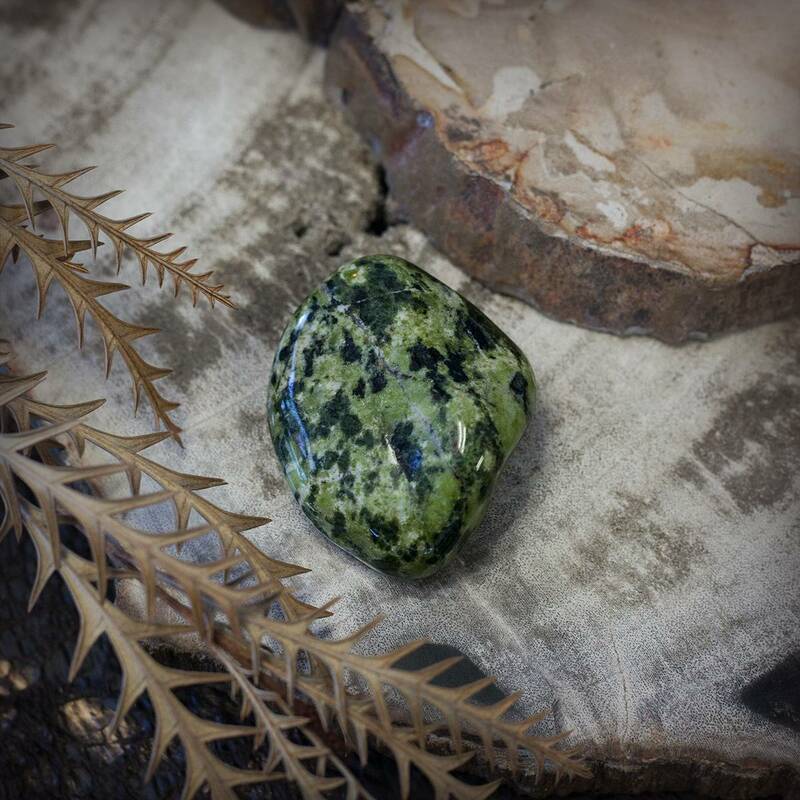 One (1) Tumbled Serpentine (about 2.25”), a potent kundalini stone. The name serpentine comes from the Greek word serpens, which means snake, and that’s how kundalini energy works. When it rises, it begins in your Root Chakra where it shakes and stirs, moving into your Sacral, your Solar Plexus, your Heart, your Throat, around your neck, and up to your Third Eye, winding winding winding, until it reaches your Crown, and BAM. Transformation. The priestess in you will rise like the phoenix. 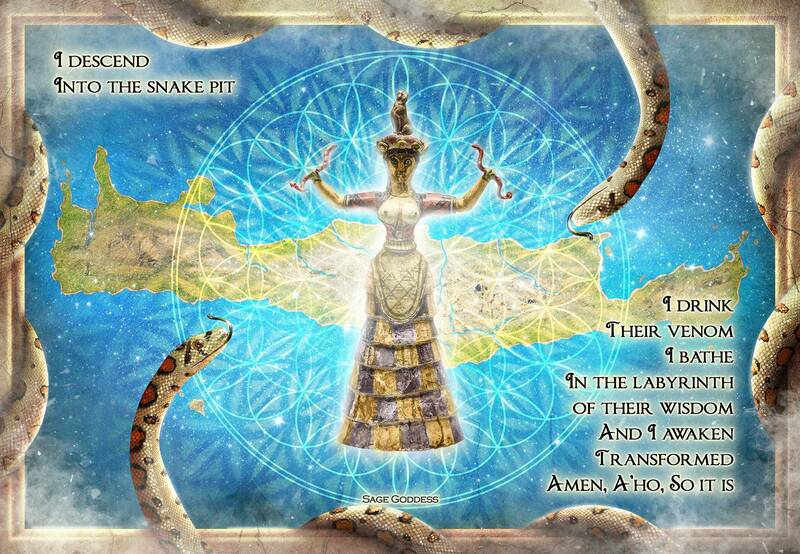 Lastly, you have the option of ordering your Into the Snake Pit Set with one (1) beautiful 8×10 canvas of original SG artwork that captures the hypnotic essence of the Minoan Snake Goddess. Use the drop down menu above to choose this offering, if you feel called. * Please always burn candles and incense on a heat proof stable surface, and never leave a burning candle unattended. This listing is for one (1) April 2018 Magic Sabbatical Set – Magic of Minoa: Into the Snake Pit, as described above. You have the option of ordering the full set with or without the 8×10 canvas artwork. Choose the offering you are called to from the drop down menu above. Yours will arrive lovingly parceled for your enjoyment and delight, along with a card describing the properties of your stone.